1.3 What is efficient R programming? 5.4.1 Native binary formats: Rdata or Rds? 8.2 Background: what is a byte? 10.3.2 Mailing lists and groups. Many people who use R would not describe themselves as “programmers”. Instead they tend to have advanced domain level knowledge, understand standard R data structures, such as vectors and data frames, but have little formal training in computing. Sound familiar? In that case this chapter is for you. In this chapter we will discuss “big picture” programming techniques. We cover general concepts and R programming techniques about code optimisation, before describing idiomatic programming structures. We conclude the chapter by examining relatively easy ways of speeding up code using the compiler package and parallel processing, using multiple CPUs. In this chapter we introduce two new packages, compiler and memoise. The compiler package comes with R, so it will already be installed. We also use the pryr and microbenchmark packages in the exercises. Be careful never to grow vectors. Avoid unnecessary computation by caching variables. Byte compile packages for an easy performance boost. Low level languages like C and Fortran demand more from the programmer. They force you to declare the type of every variable used, give you the burdensome responsibility of memory management and have to be compiled. The advantage of such languages, compared with R, is that they are faster to run. The disadvantage is that they take longer to learn and can not be run interactively. The wikipedia page on compiler optimisations gives a nice overview of standard optimisation techniques (https://en.wikipedia.org/wiki/Optimizing_compiler). R users don’t tend to worry about data types. This is advantageous in terms of creating concise code, but can result in R programs that are slow. While optimisations such as going parallel can double speed, poor code can easily run 100’s of times slower, so it’s important to understand the causes of slow code. These are covered in Burns (2011), which should be considered essential reading for any aspiring R programmers. Ultimately calling an R function always ends up calling some underlying C/Fortran code. For example the base R function runif() only contains a single line that consists of a call to C_runif(). A function call to for and to the : operator. It isn’t that the for loop is slow, rather it is because we have many more function calls. Each individual function call is quick, but the total combination is slow. Everything in R is a function call. When we execute 1 + 1, we are actually executing ‘+’(1, 1). Use the microbenchmark package to compare the vectorised construct x = x + 1, to the for loop version. Try varying the size of the input vector. Another general technique is to be careful with memory allocation. If possible pre-allocate your vector then fill in the values. You should also consider pre-allocating memory for data frames and lists. Never grow an object. A good rule of thumb is to compare your objects before and after a for loop; have they increased in length? The table below shows the timing in seconds on my machine for these three methods for a selection of values of n. The relationships for varying n are all roughly linear on a log-log scale, but the timings between methods are drastically different. Notice that the timings are no longer trivial. When \(n=10^7\), method \(1\) takes around an hour whilst method \(2\) takes \(2\) seconds and method \(3\) is almost instantaneous. Remember the golden rule; access the underlying C/Fortran code as quickly as possible. Time in seconds to create sequences. When \(n=10^7\), method \(1\) takes around an hour while the other methods take less than \(3\) seconds. Technically x = 1 creates a vector of length 1. In this section, we use vectorised to indicate that functions work with vectors of all lengths. Using 1:length(x) can lead to hard-to-find bugs when x has length zero. Instead use seq_along(x) or seq_len(length(x)). Writing code this way has a number of benefits. It’s faster. When \(n = 10^7\) the R way is about forty times faster. It doesn’t contain a bug when x is of length \(0\). As with the general example in section 3.2, the slowdown isn’t due to the for loop. Instead, it’s because there are many more functions calls. Time the two methods for calculating the log sum. What happens when the length(x) = 0, i.e. we have an empty vector? It’s also important to make full use of R functions that use vectors. For example, suppose we wish to estimate the integral \[ \int_0^1 x^2 dx \] using a Monte-Carlo method. Essentially, we throw darts at the curve and count the number of darts that fall below the curve (as in 3.1). Using sum() is quicker than an equivalent for loop. The function monte_carlo_vec() is around \(30\) times faster than monte_carlo(). 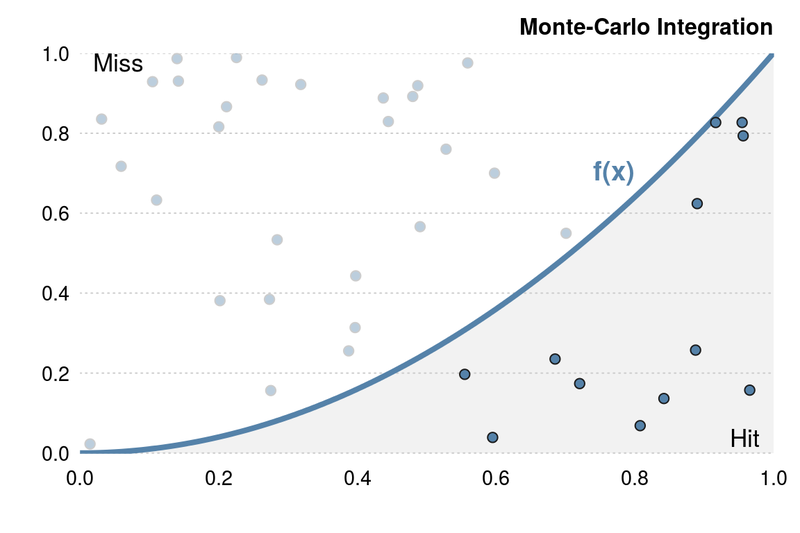 Figure 3.1: Example of Monte-Carlo integration. To estimate the area under the curve throw random points at the graph and count the number of points that lie under the curve. When we create a function we often want the function to give efficient feedback on the current state. For example, are there missing arguments or has a numerical calculation failed. There are three main techniques of communicating with the user. Fatal errors are raised by calling the stop(), i.e. execution is terminated. When stop() is called, there is no way for a function to continue. 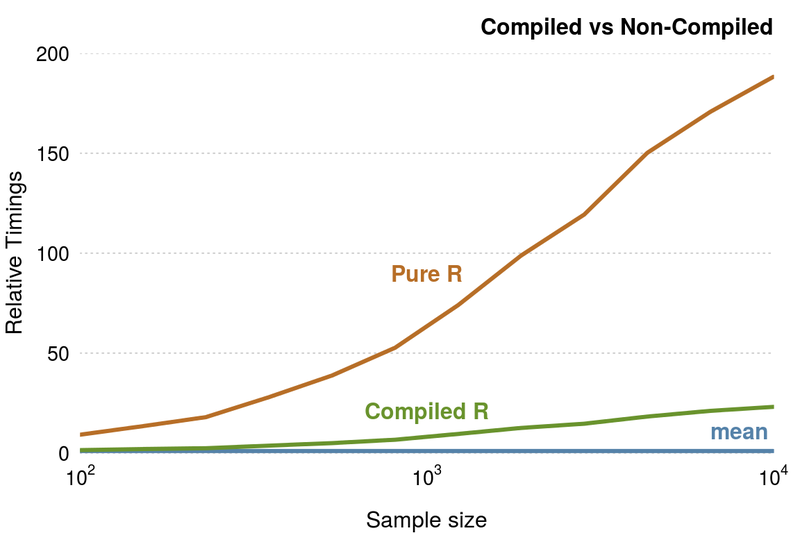 For instance, when we generate random numbers using rnorm() the first argument is the sample size,n. If the number of observations to return less than \(1\), an error is raised. When we need to raise an error, we should do so as quickly as possible; otherwise it’s a waste of resources. Hence, the first few lines of a function typically perform argument checking. #>  "Error in 1 + \"1\" : non-numeric argument to binary operator\n"
Further details on error handling, as well as some excellent advice on general debugging techniques, are given in (H. Wickham 2014a). Warnings are generated using the warning() function. When a warning is raised, it indicates potential problems. For example, mean(NULL) returns NA and also raises a warning. When we come across a warning in our code, it is important to solve the problem and not just ignore the issue. While ignoring warnings saves time in the short-term, warnings can often mask deeper issues that have crept into our code. Warnings can be hidden using suppressWarnings(). To give informative output, use the message() function. For example, in the poweRlaw package, the message() function is used to give the user an estimate of expected run time. Providing a rough estimate of how long the function takes, allows the user to optimise their time. Similar to warnings, messages can be suppressed with suppressMessages(). Another function used for printing messages is cat(). In general cat() should only be used in print()/show() methods, e.g. look at the function definition of the S3 print method for difftime objects, getS3method("print", "difftime"). The stop() function has an argument call. that indicates if the function call should be part of the error message. Create a function and experiment with this option. When the function is called, a scatter graph is plotted with the line of best fit, but the output is invisible. However when we assign the function to an object, i.e. out = regression_plot(x, y) the variable out contains the output of the lm() call. However if we assign the output to an object, out = hist(x), the object out is actually a list containing, inter alia, information on the mid-points, breaks and counts. In this case the c() function is using the underlying integer representation of the factor. Dealing with the wrong case of behaviour is a common source of inefficiency for R users. Often categorical variables get stored as \(1\), \(2\), \(3\), \(4\), and \(5\), with associated documentation elsewhere that explains what each number means. This is clearly a pain. Alternatively we store the data as a character vector. While this is fine, the semantics are wrong because it doesn’t convey that this is a categorical variable. It’s not sensible to say that you should always or never use factors, since factors have both positive and negative features. Instead we need to examine each case individually. As a general rule, if your variable has an inherent order, e.g. small vs large, or you have a fixed set of categories, then you should consider using a factor. would create a boxplot where the \(x\)-axis was alphabetically ordered. By converting type into factor, we can easily specify the correct ordering. Most users interact with factors via the read.csv() function where character columns are automatically converted to factors. This feature can be irritating if our data is messy and we want to clean and recode variables. Typically when reading in data via read.csv(), we use the stringsAsFactors = FALSE argument. Although this argument can add in the global options() list and placed in the .Rprofile, this leads to non-portable code, so should be avoided. Factors are slightly more space efficient than characters. Create a character vector and corresponding factor and use pryr::object_size() to calculate the space needed for each object. Each function takes at least two arguments: an object and another function. The function is passed as an argument. Every apply function has the dots, ..., argument that is used to pass on arguments to the function that is given as an argument. Using apply functions when possible, can lead to shorter, more succinct idiomatic R code. In this section, we will cover the three main functions, apply(), lapply(), and sapply(). Since the apply functions are covered in most R textbooks, we just give a brief introduction to the topic and provide pointers to other resources at the end of this section. Most people rarely use the other apply functions. For example, I have only used eapply() once. Students in my class uploaded R scripts. Using source(), I was able to read in the scripts to a separate environment. I then applied a marking scheme to each environment using eapply(). Using separate environments, avoided object name clashes. Table 3.1: The apply family of functions from base R.
The apply() function also works on higher dimensional arrays; a one dimensional array is a vector, a two dimensional array is a matrix. The lapply() function is similar to apply(); the main differences are the input types are vectors or lists and the return type is a list. Essentially, we apply a function to each element of a list or vector. The functions sapply() and vapply() are similar to lapply(), but the return type is not necessary a list. Movies are rated between \(1\) and \(10\) by fans. 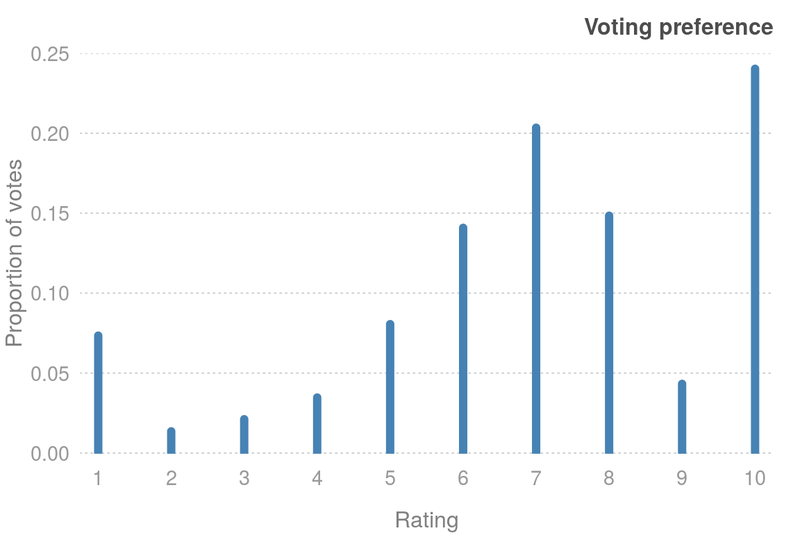 Columns \(7\) to \(16\) of the movies data set gives the percentage of voters for a particular rating. Figure 3.2: Movie voting preferences. This can cause unexpected problems. The functions lapply() and vapply() are type consistent. Likewise dplyr::select() and dplyr:filter(). The purrr package has some type consistent alternatives to base R functions. For example, map_dbl() etc. to replace Map() and flatten_df() to replace unlist(). Almost every R book has a section on the apply function. Below, we’ve given the resources we feel are most helpful. Each function has a number of examples in the associated help page. You can directly access the examples using the example() function, e.g. to run the apply() examples, use example("apply"). There is a very detailed Stackoverflow answer description when, where and how to use each of the functions. In a similar vein, Neil Saunders has a nice blog post giving an overview of the functions. The apply functions are an example of functional programming. Chapter 16 of R for data Science describes the interplay between loops and functional programming in more detail (Grolemund and Wickham 2016), while H. Wickham (2014a) gives a more in-depth description of the topic. Rewrite the sapply() function calls above using vapply() to ensure type consistency. How would you make subsetting data frames with [ type consistent? Hint: look at the drop argument. If we compare the two methods on a \(100\) row by \(1000\) column matrix, the cached version is around \(100\) times faster (figure 3.3). 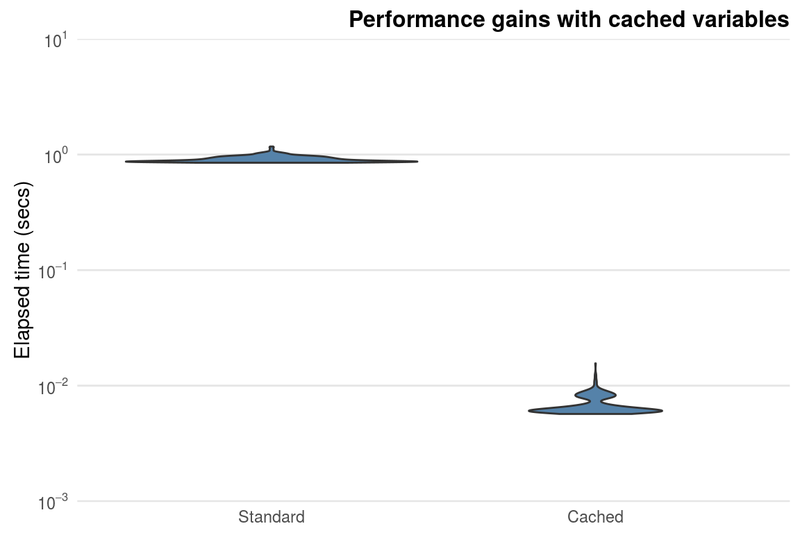 Figure 3.3: Performance gains obtained from caching the standard deviation in a \(100\) by \(1000\) matrix. A more advanced form of caching is to use the memoise package. If a function is called multiple times with the same input, it may be possible to speed things up by keeping a cache of known answers that it can retrieve. The memoise package allows us easily store the value of function call and returns the cached result when the function is called again with the same arguments. This package trades off memory versus speed, since the memoised function stores all previous inputs and outputs. To cache a function, we simply pass the function to the memoise function. suggests that we can obtain a \(100\)-fold speed-up. Construct a box plot of timings for the standard plotting function and the memoised version. The following section is meant to provide an introduction to function closures with example use cases. See (H. Wickham 2014a) for a detailed introduction. Without using function closures, the stop-watch function would be longer, more complex and therefore more inefficient. When used properly function closures are very useful programming tools for writing concise code. Write a stop-watch function without using function closures. Many stop-watches have the ability to measure not only your overall time but also you individual laps. Add a lap() function to the stop_watch() function that will record individual times, while still keeping track of the overall time. A related idea to function closures, is non-standard evaluation (NSE), or programming on the language. NSE crops up all the time in R. For example, when we execute, plot(height, weight) R automatically labels the x- and y-axis of the plot with height and weight. This is powerful concept that enables us to simplify code. More detail is given in the “Non-standard evaluation” of (H. Wickham 2014a). The compiler package, written by R Core member Luke Tierney has been part of R since version 2.13.0. The compiler package allows R functions to be compiled, resulting in a byte code version that may run faster8. The compilation process eliminates a number of costly operations the interpreter has to perform, such as variable lookup. #> standardGeneric for "mean" defined from package "base"
#> Use  showMethods("mean")  for currently available ones. The third line contains the bytecode of the function. This means that the compiler package has translated the R function into another language that can be interpreted by a very fast interpreter. Amazingly the compiler package is almost entirely pure R, with just a few C support routines. Next we create an inefficient function for calculating the mean. This function takes in a vector, calculates the length and then updates the m variable. The compiled function is around seven times faster than the uncompiled function. Of course the native mean() function is faster, but compiling does make a significant difference (figure 3.4). Figure 3.4: Comparsion of mean functions. to the DESCRIPTION file. Most R packages installed using install.packages() are not compiled. We can enable (or force) packages to be compiled by starting R with the environment variable R_COMPILE_PKGS set to a positive integer value and specify that we install the package from source, i.e. A final option to use just-in-time (JIT) compilation. The enableJIT() function disables JIT compilation if the argument is 0. Arguments 1, 2, or 3 implement different levels of optimisation. JIT can also be enabled by setting the environment variable R_ENABLE_JIT, to one of these values. We recommending setting the compile level to the maximum value of 3. The impact of compiling on install will vary from package to package: for packages that already have lots of pre-compiled code speed gains will be small (R Core Team 2016). Not all packages work if compiled on installation. Burns, Patrick. 2011. The R Inferno. Lulu.com. Wickham, Hadley. 2014a. Advanced R. CRC Press. Grolemund, G., and H. Wickham. 2016. R for Data Science. O’Reilly Media. R Core Team. 2016. “R Installation and Administration.” R Foundation for Statistical Computing. https://cran.r-project.org/doc/manuals/r-release/R-admin.html.